What we have here is failure to pontificate. Dr. Mike Baird doesn’t consider himself a big deal even though he recently was named the 17th professor emeritus in Grand Canyon University history (see chart). He takes what he does very seriously, but his self-deprecating sense of humor would never him allow him to look at himself that way. 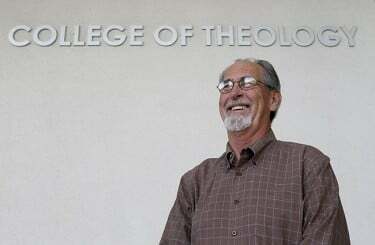 Especially when he now has the same title that two other legendary College of Theology professors, Dr. J. Niles Puckett and Dr. D.C. Martin, once did. “Those guys are my idols — seriously,” Baird said. “After D.C. passed away in 1995, we declared him ‘St. Martin,’ and we’ve been meeting ever since then with our ‘St. Martin Society.’ He was my mentor when I first came, and Dr. Puckett was my teacher. I actually studied Greek and the New Testament, which became my career, under Dr. Puckett, and then he was there when I came to teach, and Dr. Martin was there, too. 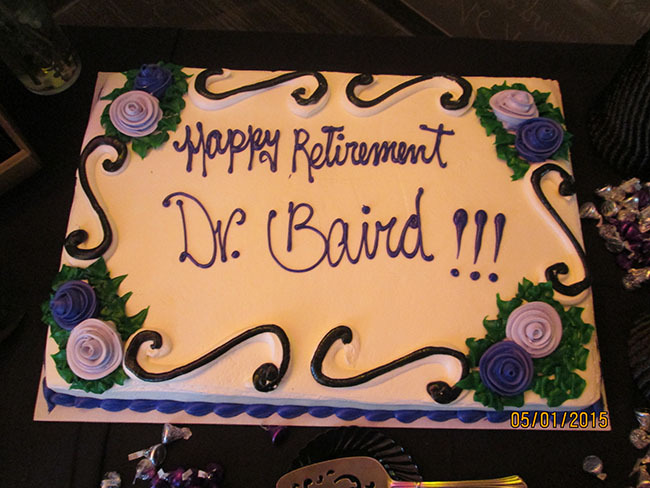 Dr. Baird’s retirement party last year showed how much he is beloved and respected in the College of Theology. Radda had seen how beloved and respected Baird is when he attended the longtime professor’s retirement party last year. Baird continued to write curriculum for the University’s master of divinity (M.Div.) program during the 2½ months he was recuperating, and once he healed he took advantage of his newfound free time to start hiking two days a week. But that hardly means he’s not still heavily involved in the College of Theology. He still likes to get up in the morning and write curriculum while the coffee is brewing, and he meets regularly with curriculum designers. But he has a typically humble approach to the concept of other instructors teaching the curriculum he devised. Being an adjunct has helped him, Baird said, “because it gave me a chance to see how what I write treats the teacher.” And Baird also puts himself in the shoes of others when he considers his new professor emeritus role. And that’s the biggest deal of all. This is so great to see! I learned much from Drs. Baird, Youngblood, Gaines, and James White during my four years at GCU (’93-’97). Congratulations to you Dr. Baird! Your class was my favorite in my undergrad! You were also the most encouraging of my instructors when I finished my last final in your class to go to Save A Day surgery prep at St Joseph’s for brain surgery. I still remember your exhortations and well wishes! I was in Mike’s Greek class back in 1969. I would get up at 4 am to study for Dr. Puckett’s class. Mike would be sitting in the student center 10 minutes before class doing his studying. Dr. Baird, congratulations on the honor you have received. Thank you for your steadfast efforts at GCU through the decades. You and Dr. Youngblood were a blessing to me and many others, Glad to hear about your work with curriculum writing. Dr. Martin, Dr. Puckett and others would be very pleased. Congratulations, Dr. Baird! You are well-deserving of this distinction. As one of your first Greek students at GCC in 1981, I learned much and am now teaching some basic Greek to one of my inmates in the chapel at High Desert State Prison (Susanville, CA) where I serve as chaplain. But I most remember your encouragement as you were instrumental in helping me discern God’s call to Bangladesh as a BSU summer missionary in 1982. Blessings, my friend, and enjoy those hikes! Thank you, Dr. Mike Baird. Thirty-seven years ago, I drove my ’72 Chevy Pickup (which I still drive) from Las Vegas via St. George, UT to Grand Canyon College (GCC) to begin my education for ministry. One of the very first people I met was Mr. Mike Baird, Dean of Students at GCU. Mike was young but seemed older and very wise. He was compassionate for the students on who we might serve the Lord best. He counseled, encouraged, coached me and so many others. I appreciate all of my professors and mentors at GCC/GCU and certainly the friendships and memories made a GCU. 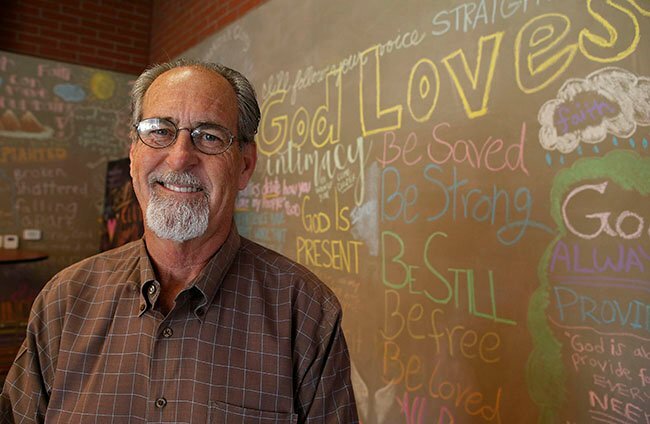 I am most thankful for Mike and so many others at GCU you gave willingly and sacrificially to educate a new wet behind the ears preacher boy, who married well while at GCU and has been blessed with five children (a handsome grandson) and a lifetime of ups and downs of being in the ministry. Mike, you played a strategic role in my development for the ministry. Thanks for being so willing.